CD222 antibody LS-C393105 is an unconjugated rabbit polyclonal antibody to human CD222 (IGF2R). Validated for Peptide-ELISA and WB. 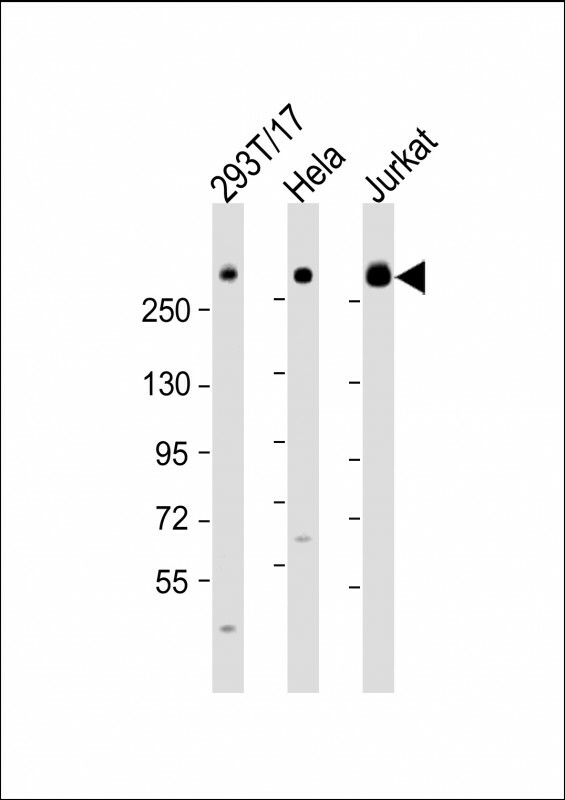 This IGF2R antibody is generated from a rabbit immunized with a KLH conjugated synthetic peptide between 2424-2458 amino acids from human IGF2R. All lanes: Anti-IGF2R Antibody (C-Term) at 1:2000 dilution. Lane 1: 293T/17 whole cell lysate. 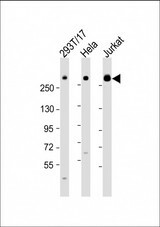 Lane 2: HeLa whole cell lysate. Lane 3: Jurkat whole cell lysate Lysates/proteins at 20 ug per lane. Secondary Goat Anti-Rabbit IgG, (H+L), Peroxidase conjugated at 1:10000 dilution. Predicted band size: 274 kDa. Blocking/Dilution buffer: 5% NFDM/TBST.